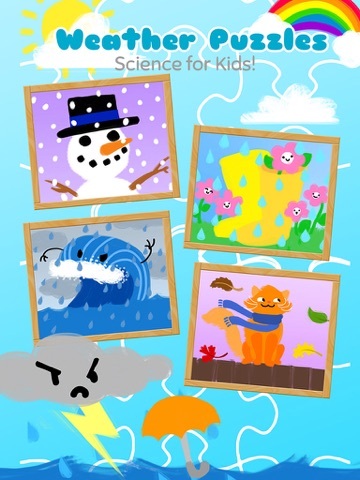 Weather Puzzles: Science for Kids is a fun puzzle app that, not surprisingly, is full of jigsaw puzzles related to the weather. 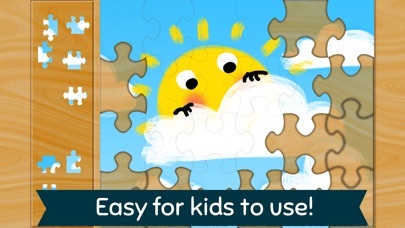 All of the puzzles features bright, happy images related to the weather, and are designed to entertain kids of different ages, from toddlers just learning to solve jigsaw puzzles to more advanced puzzle solvers in early elementary school. As kids complete the puzzles, they’ll learn a little bit about the weather and may also be inspired to go outside and experience the weather where they live. The main screen of the app is a little bit busy. 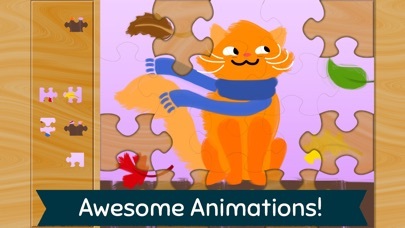 All of the available puzzles appear in a horizontal line across the screen and kids can swipe through them to choose the puzzle they want to solve. Below the line of puzzles are icons for the settings area and parent area. Between those icons in a larger box that displays additional apps kids can download. The apps displayed in the box rotate, drawing kids’ attention to them. Once kids select a jigsaw puzzle to play, the is fairly simple. 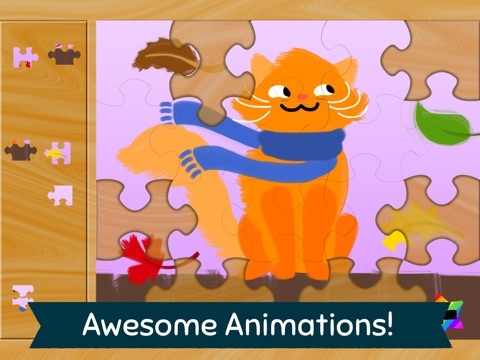 Kids drag and drop the pieces into the correct places on the puzzle until they have completed the picture. The pieces move smoothly and it’s easy for kids to place them. 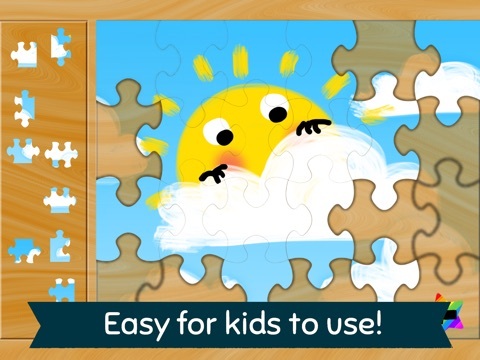 In the settings area, parents can turn on/off the puzzle outline and the background image to make the puzzle easier or harder for kids to solve. 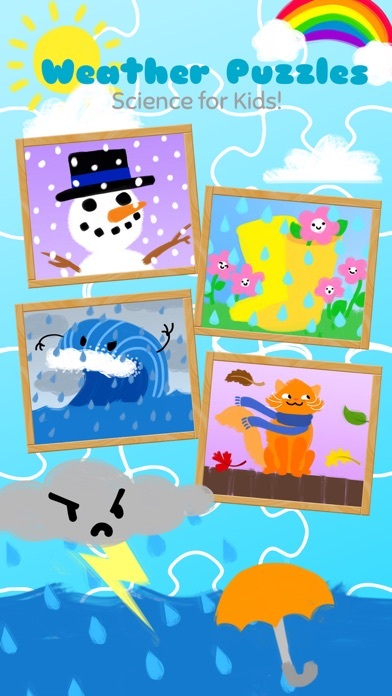 There are two educational components to the app: the puzzles themselves and the weather pictures. While the app has “Science for kids” in its title, it doesn’t include much information about science. 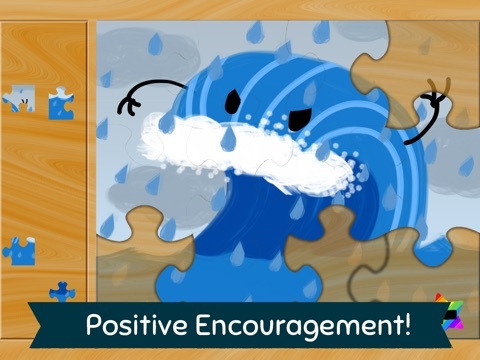 The puzzles are just cute pictures related to the weather. It’d be nice if they also included some weather facts or even words to tell kids what type of weather was being depicted. 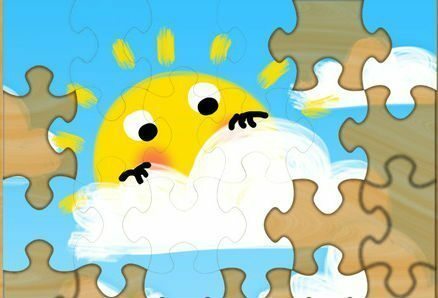 For example, the smiling sun could say, “It’s sunny today” when kids complete the puzzle. Parents and teachers who are working with kids as they complete the app should engage them in conversations about the weather to help enhance the educational value of the app. The puzzle component of the app offers a bit more educational value. While the puzzles are fairly simple, the app provides multiple ways to increase their difficulty. In the settings area, parents or kids can choose from a range of puzzle sizes from 9-24 pieces. 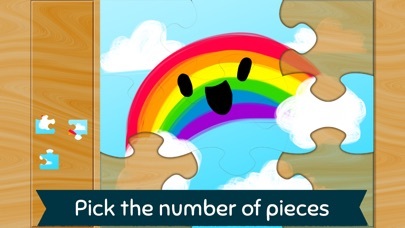 They can also turn off the background image and outline to make the puzzle more difficult to solve. Little kids, in particular, will enjoy this app because of the bright happy pictures. 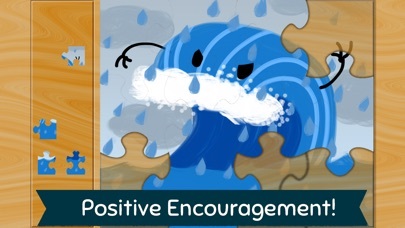 Even thunderstorms are adorable when depicted in this app. 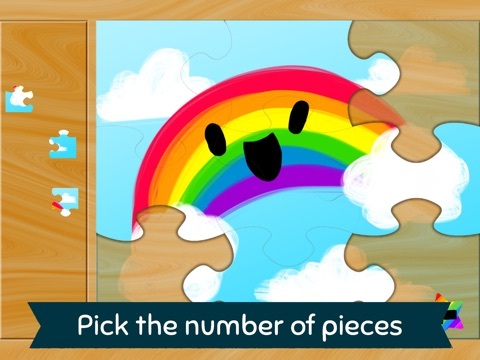 There are plenty of puzzles for kids to solve, so kids will get many hours of entertainment out of the app’s content. Given the number of puzzles kids can solve and the various levels of difficulty at which they can solve them, this app offers a fairly good value. It is particularly valuable to kids interested in the weather and kids who like to talk about the weather. One area where the app could use some improvement is its child friendliness. A “rate this app” box occasionally pops up when you first open the app and it’s not protected by a parental block. On the main screen, kids will also see fairly large advertisements for additional apps. While these advertisements, and the parent area, are protected by a parental block, they’re a bit annoying and the block could be stronger.